We’re talkin’ Old Skool Hip-Hop, R&B, Disco, even some pop and alternative from the ’80s, ’90s, and going waaaaay back to the ’70s. We throw in a few “newer skool” ones that fit the HOT102 sound – just to keep it fresh, too. 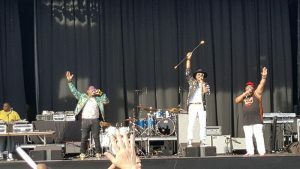 Yes, Bruno Mars is part of that. HOT102 streams great music and programming 24/7/365 (366, on those leap years) in the true spirit of the original! Stream from your computer by clicking “Listen Live” here, or if you’re on the go, stream us with your smartphone! We’re also on TuneIn – just look up “HOT102” and we’re right there! 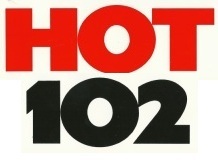 We’re not affiliated with the original company that owned HOT102, but some of us used to work there. They flipped it in 1994 but we still love the original so much we brought it back online. We also have old HOT102 videos, “street sheets”, listening links, pictures, and a lot more on places like our History page. Sugarhill Gang, Melle Mel, and Scorpio, all part of a great old school Hip-Hop show at Summerfest 2018.